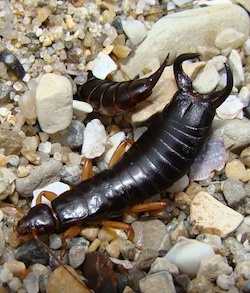 SAN FRANCISCO, August 15, 2012 -- Symmetrical looks are highly prized in the animal kingdom, but according to a new report by San Francisco State University biologists on an insect called the maritime earwig, asymmetry might come with its own perks. This is a male maritime earwig with asymmetric weapons on the beach. Animals—including humans—seem to use symmetry as a shortcut for evaluating potential mates. Symmetrical features usually indicate normal development, while asymmetry could point to an underlying developmental defect that would render a mate less fit. "The evolutionary theory that underpins symmetry in mate choice is very straightforward," said Andrew Zink, assistant professor of biology. "Asymmetry is likely to represent a heritable defect in foraging or survival, and therefore females who pick more symmetrical males are more likely to pass on genes for success." But the study conducted by Zink's graduate student Nicole Munoz, published August 15 online by the journal Ethology, suggests there are some instances where asymmetrical features are useful enough to be maintained among males in a population. Male maritime earwigs use two pinchers or forceps protruding from their abdomen as weapons in the fight for food and females. Males bear a pair of asymmetric forceps, where one forcep (right versus left) is longer and more curved than the other. The males use the strongly curved forcep to hook over and lock on to the abdomen of another male during a battle. In Munoz and Zink's experiments, hungry male earwigs of different body sizes and different forcep shape fought over a piece of food glued down to a surface. The researchers found that larger males were able to dominate smaller males in these battles -- no matter how their forceps appeared. But when smaller males fought each other, the one with the more asymmetric forceps was usually the winner. The study is one of very few to look at asymmetry in body features that function as a weapon, "and weapons should be under strong selection, since they are used both to fight with other males for mates and to capture prey," Zink said. The researchers also performed an experiment where they manipulated forceps asymmetry in smaller males by clipping one of the forceps. They soon discovered that the winners in these battles were determined by the original forcep asymmetry among the insect pairs -- rather than the manipulated asymmetry -- suggesting that asymmetry may be linked to another unknown feature that affects dominance and aggression. Zink added that "one of the obvious questions is whether females prefer to mate with males that have more asymmetric forceps, given that they will pass this beneficial trait along to their sons." This question of female choice is currently the subject of additional graduate student experiments in the lab. But for now, it appears that being asymmetric is a benefit rather than a cost for males that compete for mates and/or food, making this one of the first studies to reveal a benefit for asymmetric weapons.